First Friday Trolley Hops And Exhibition Openings Are Always FREE! as a dream to build interest in our state's rich craft and art resources. With the help of Mary Shands, the seeds were quickly sown for the Kentucky Art and Craft Foundation to continue to develop and eventually have a physical presence in Louisville. In 1984 the organization moved into the lower level of 609 West Main Street for retail and exhibition space. At that time, West Main Street was very deserted, yet the importance and popularity of the organization exploded. 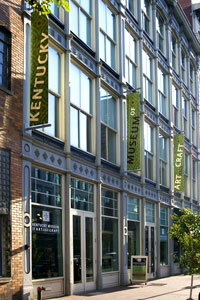 The Kentucky Museum of Art and Craft was established to promote the rich art and craft heritage of Kentucky through three main areas of programming: exhibition, education, and support of artists through a retail Gallery Shop. Since 1984 the organization has presented over 175 exhibitions, reaching approximately 65,000 viewers annually. By 1991 the Kentucky Art and Craft Foundation was a leader on the national forefront in preserving and advancing the art and craft heritage of Kentucky. As part of the national 'Year of the American Craft' the organization was recognized for making exemplary and unprecedented contributions to the documentation and interpretation of the cultural history of the commonwealth. The organization has seen artists progress from novices to masters and Main Street transform from an almost a deserted noncommercial street to the thriving business and cultural district it is today. However, the organization's commitment to preserving one of Kentucky's most precious resources, its continuing tradition of fine craftsmanship, has remained the same. 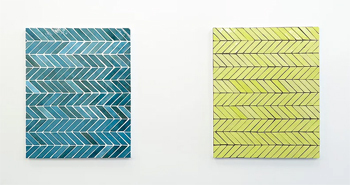 By bringing the work of nationally recognized artists to Kentucky and by bringing the work of Kentucky artists to the national scene, KMAC has been able to preserve art and craft heritage and advance it. Over ten years ago we recognized the importance of including educational programming as part of our mission. The time was right for such an initiative, because in 1990 the state's educational system had been restructured resulting in the Kentucky Educational Reform Act, or KERA. Our educational programs are tightly connected to the KERA goals of combining art education with other subjects such as history, social studies, mathematics and language arts. Over the years, our educational programming has soared and its focus has continued to increase our work with under-served schools in our Education Center, Jefferson County, and throughout the state. In January of 2001 the organization purchased two adjacent buildings at 715 and 717 West Main Street in the heart of Louisville's West Main Street Historic District (thanks to a successful Capital Campaign). Built in the 1880's the building is a four-story cast iron structure with a beautiful pastel facade and giant windows. After renovation, the facility provides us with 27,000 square feet of interior space in which to operate, spread over four floors and a lower level. This is an increase from the 10,000 square feet we used to occupy at 609 West Main Street. The new facility increased the size and visibility of the Gallery Shop, with frontage on Main Street, and houses three exhibition galleries: the Steve Wilson Gallery, the Mary + Al Shands Gallery, and the Lindy + Bill Street Gallery. The Lindy + Bill Street Gallery, on the second floor overlooking Main Street, is rented for meetings and entertaining. The third floor houses the Education Center and the fourth floor is used for administrative offices. We are delighted to be expanding as an arts organization and to be in such close proximity to Frazier International History Museum, Glassworks, Louisville Slugger Museum & Factory, Louisville Science Center, 21c Museum Hotel, Muhammad Ali Center, The Kentucky Center for the Performing Arts and KentuckyShow!. This is truly a testament to downtown development and the success of the West Main Street district. Visit www.museumrowonmain.com for more info! The KMAC Museumt has an emerging collection of objects that relate to our history of showing and promoting crafts in Kentucky. Housed in the Brown-Forman Gallery on the third floor, our Permanent Collection features work by artists such as Marvin Finn, Rebecca Seigel, Minnie & Garland Adkins, Sarah Frederick, Rude Osolnik, Alma Lesch and Wayne Ferguson.